LONDON (Reuters) - Tesla Inc's biggest institutional investor said on Wednesday it was questioned by U.S. securities regulators about Elon Musk's now-abandoned plans to take the electric carmaker private and that the chief executive needed help running the company. "He needs help, and I mean that psychologically as much as practically," said asset manager Baillie Gifford's James Anderson, the fund manager of Scottish Mortgage Investment Trust, which owns Tesla shares. 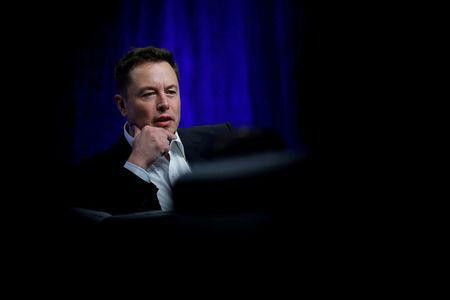 The last few months have been tumultuous and chaotic for Tesla and its eclectic CEO. While Tesla was wrestling to ramp up production of its mass-market electric Model 3 sedan, on Aug. 7 Musk tweeted that he was considering taking the company private at $420 per share and that funding was "secured." Musk was "getting there" on the idea of accepting more help in running the company, Anderson said. Anderson said that he had suggested to Musk his tweets are "not a great thing" and added that the firm had been talking to the SEC about Musk's proposal and financing claims. "I don’t know what they’ll do with him, but there’s no implication that we’ve done anything wrong," Anderson said in an interview at the firm's London office. "I think quite naturally they wanted to know whether major shareholders had any lead indication or knowledge of the tweet about ‘funding secured.’"
Anderson said he had spoken with Musk twice and was arranging to speak with the company's board. Anderson added that the media coverage around the going-private comments has not shaken his belief in Tesla or its "extraordinary" CEO. "We think there is a decent chance that they can prove to be an extremely profitable, competitively advantaged company which will produce high returns," Anderson said.